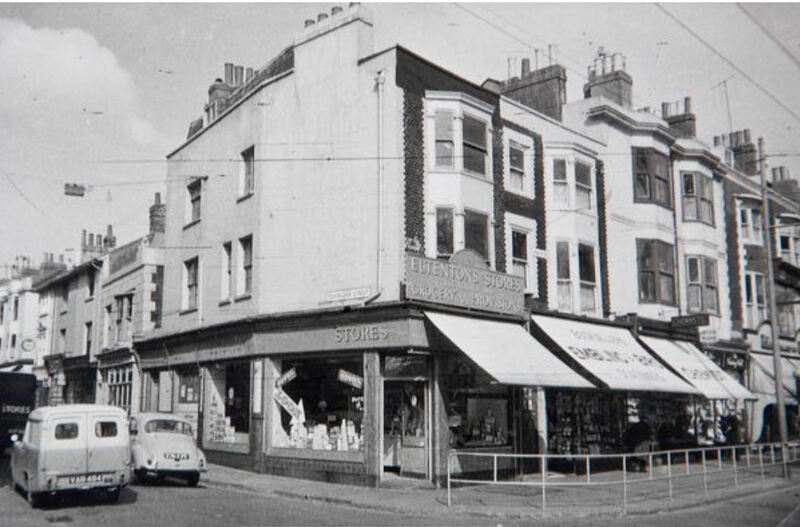 At eighteen I went to work in a ladies fashion shop in York Place called ‘Constables’. It was a building on the right side of the gates of Margaret Hardy School. There was a sweet and tobacconist shop between Constables and the school gates. It was a fairly small shop, but my job was to assist the chief window dresser. There were two main windows running from the shop door down to the pavement forming an arcade, and one central island window that could be walked around before entering the shop. This central island suggests to me that Constables actually occupied two connecting buildings. I had not thought of it like that at the time but there were two stairways inside leading to the floors above. Ladies fashions in those days were still regular size. So this was just before teen sizes and shorter lengths hit the town. Working in dress shop windows is always interesting. If you stand still to think a while chances are you startle someone who is browsing the window and unconsciously assuming that you are a mannequin. It always brought peals of laughter from those outside who are not expecting a model to suddenly come to life. Sometimes I would feel a little shy of people watching me work especially when the model’s arms and bodies had to come apart and wigs removed. That often brought on wild remarks, and a blush or two on my part. I have very fond memories of the staff at that time. There was Sheila, with whom I worked in the windows, Mrs Watts, Miss Godfrey, and Hazel. Mrs Wilson worked in the office, and apparently, despite being an older woman, still took a daily dip in the sea before work each day. Then there was Hetty a young girl of my age, and Daphne who came later and was a bridesmaid at my wedding. A lady, whose face I remember well but name I have forgotten, who would collect alterations to work on at home. It was a good period for me and I liked my job. And, while I was still working there, I remember buying a lovely white coat with a fur collar for my ‘Going away’ outfit for my honeymoon just two years later on. The numbers 17 and 18 York Place ring in my mind, so having looked at these numbers on Google street maps, it very much confirms my thoughts that Constables occupied these two premises, and that the little building between number 17 and the gates of the school was indeed the sweet and tobacconist shop. It’s strange how so many shops used to have those blinds, and now so few have them. One would assume they had a functional purpose, rather than just show, to keep the shop cooler I guess, perhaps air con has taken over, to the detriment of the environment! Hi Peter, Another thing they may have been there for was as a rain shelter. Many shops used to display their wares outside on benches and if there was a sudden shower, it would help prevent the display getting wet. Perhaps there was also an element that people sheltering under the blind from the rain were a captive audience. However, I recall that often an unexpected passer-by would be given a soaking when the shopkeeper came out with a broom to disperse a pool that had formed in the blind! The outside shades were to help stop the sun fading the stock. Or shading meat and cheeses, according to what the stock was. Did we have more sun in those days? I often think we did. Long, hot summer holidays is what I recall.